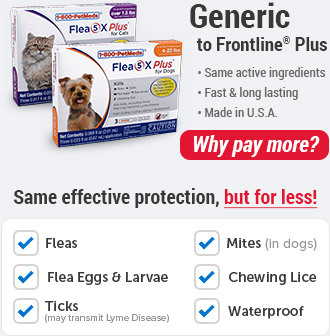 What are 1-800-PetMeds Brite Coat Chews for Cats and Dogs? 1-800-PetMeds Brite Coat Chews for Cats and Dogs are concentrated fatty acid dietary supplements, for healthy skin and a soft, shiny coat. These supplements contain a combination of Omega 3 and Omega 6 fatty acids derived from Fish Oil and Safflower Oil. Made in the USA. Active ingredients Omega 3 and Omega 6 help improve skin health and restore a shiny coat. For pet use only. Keep out of reach of children. 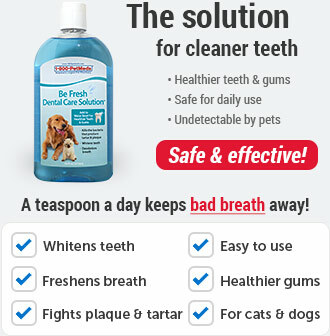 Your pet may consider this a treat. In case of accidental overdose contact a healthcare professional immediately. Oat flour, rye flour, glycerin, natural chicken liver flavor, brewers dried yeast, arabic gum, safflower oil, water, soy lecithin, fish oil concentrate, maltodextrin, sodium alginate, calcium sulfate, Vitamin E supplement, safflower oil concentrate, citrus pectin, sorbic acid (a preservative), propionic acid (a preservative), mixed tocopherols (a preservative). 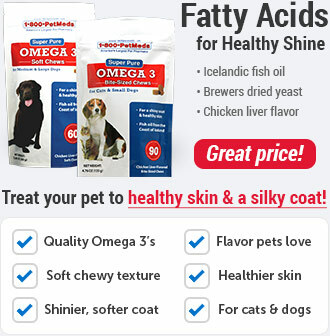 1-800-PetMeds Brite Coat is a concentrated fatty acid dietary supplement for healthy skin and a soft and shiny coat. 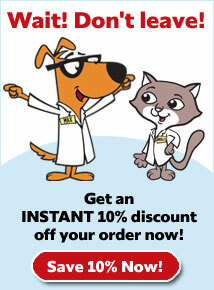 1-800-PetMeds Brite Coat is a non-prescription (OTC) product. For dogs up to 25 lbs, give 1 chew daily. 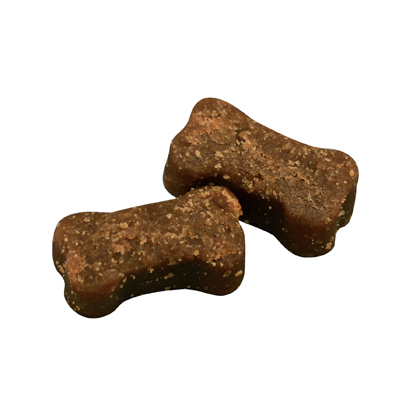 For dogs 26-50 lbs, give 2 chews daily. 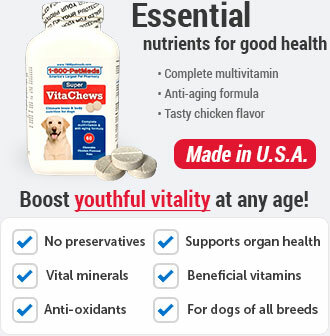 For dogs 51-75 lbs, give 3 chews daily. For dogs 75+ lbs, give 4 chews daily. For adult cats, give 1/2 chew daily. 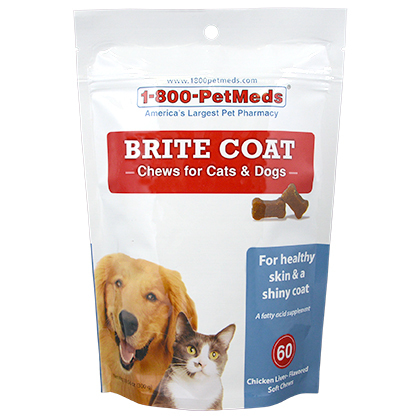 1-800-PetMeds Brite Coat Chews are intended as a supplement for pets only. Keep out of reach of children. Contact a healthcare professional immediately. Store in a cool, dry place. Your pet may consider this a treat, so keep this product out of reach of pets and children. 1-800-PetMeds Brite Coat Chews are yummy chewable, dietary supplements with a natural chicken-liver flavor that improves your pet's skin and coat. 1-800-PetMeds Brite Coat Chews contain Omega 3 and Omega 6 fatty acids, and Vitamin E.
Consult your veterinarian before giving your pet any dietary supplement. Should be stored in a cool, dry place. 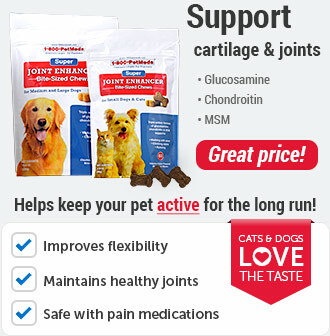 Your pet may consider this a treat, so keep this product out of reach of pets and children. Other Ingredients: Oat flour, rye flour, glycerin, natural chicken liver flavor, brewers dried yeast, arabic gum, safflower oil, water, soy lecithin, fish oil concentrate, maltodextrin, sodium alginate, calcium sulfate, Vitamin E supplement, safflower oil concentrate, citrus pectin, sorbic acid (a preservative), propionic acid (a preservative), mixed tocopherols (a preservative). * Not recognized as an essential nutrient by the AAFCO Dog and Cat Food Nutrient Profiles.